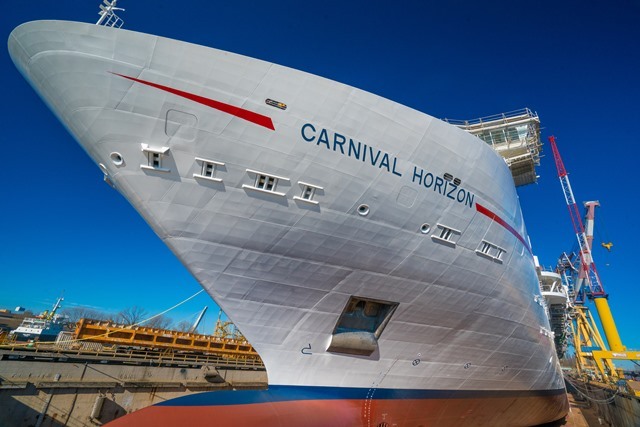 In a time-honored maritime tradition dating back centuries, a ceremony was held earlier today aboard Carnival Horizon at the Fincantieri shipyard in Marghera, Italy, during which a commemorative coin was welded to the ship’s mast to mark a significant construction milestone. The coin ceremony – whose origins can be traced back to the ancient Romans who believed that attaching coins to a ship provided divine protection – signifies the successful completion of Carnival Horizon’s exterior outfitting. Fabrizio Timossi of Carnival’s corporate shipbuilding department represented Carnival at the ceremony with Clementina Zecchin of Fincantieri’s Marghera yard serving as godmother. The 133,500-ton Carnival Horizon – a sister ship to the hugely popular Carnival Vista introduced last year – is set to debut in Europe April 2, 2018. Carnival Horizon will offer many of the innovative indoor and outdoor dining, bar, entertainment and activity options that debuted on Carnival Vista. Among those is a groundbreaking bike-ride-in-the-sky attraction called SkyRide, an IMAX Theatre and a massive WaterWorks aqua park with corkscrew slides, a tipping bucket and other attractions promising lots of splash-tastic fun. A wide range of accommodations will also be offered, including spa cabins with exclusive privileges at the luxurious Cloud 9 Spa, extra-roomy staterooms in Family Harbor, and tropical-inspired Havana staterooms and suites with exclusive daytime access to a Cuban-themed bar and pool. A variety of unique dining and bar concepts and spectacular outdoor spaces found only on Carnival Horizon will also be offered and revealed in the near future. Carnival Horizon is scheduled to make its maiden voyage April 2, 2018, with a 13-day Mediterranean cruise from Barcelona – the first of four round-trip departures from this port. Carnival Horizon will reposition to the U.S. with a 14-day trans-Atlantic crossing from Barcelona to New York May 9-23, 2018. Following its summer schedule of four-day Bermuda and eight-day Caribbean departures from the Big Apple, Carnival Horizon will shift to Miami and kick off a year-round schedule of six- and eight-day Caribbean cruises beginning Sept. 22, 2018. Carnival Horizon will also offer a special two-day cruise to Nassau from Miami Sept. 20-22, 2018.